Keeping your tactical shoes clean means you'll get more miles out of them, and proper maintenance doesn't take that long. Clean your tactical shoes or boots every time they start to appear dirty. Don't worry – it won't be nearly as often as you need to wash your tactical socks. 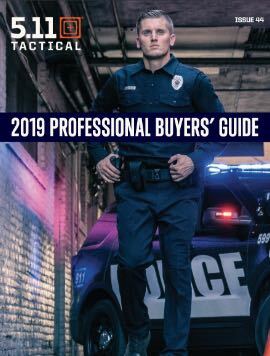 Here's everything you need to know about cleaning suede tactical boots, plus other basics of leather boot care. Suede tactical boots, like those worn with daily military uniforms, require a different cleaning process than leather boots do. Brush away any clumps of mud or dirt with a towel. Gently rub away scuffs with an eraser. Lightly dampen one of the clean cloths, and run it over the entire boot surface to remove surface dirt and debris. Scrub the suede with a horsehair or similar soft-bristled brush to work out ground-in dirt. Brush the suede in one direction. Dip the damp cloth in white vinegar or a mixture of gentle dish detergent and warm water to remove any lingering stains. Use small, circular motions on the stain to gently remove it. Apply silicone spray to the suede and buff it with a soft, dry cloth. If your suede tactical boots are oil-stained, mix cornstarch and water into a paste. Apply it to the stain and let it dry, then brush it away with a soft-bristled brush. Cleaning leather boots is part of the shining process. Remove dust and dirt from your boots with a soft-bristled brush. Pay special attention to the crevices, and use gentle, back-and-forth motions. Wipe your boots with a damp cloth to remove any dirt or debris that's left over after brushing. Apply a thick layer of polish using small, circular motions with a dry, cotton cloth. Let the coat of boot polish dry for 15 minutes. Scrub the boots with the soft-bristled brush or a dry cloth to remove excess polish. Wait an additional 5 minutes before applying more polish. Apply a small amount of polish with a damp cotton cloth. Use circular motions all over your boot and pick up more polish when it starts to wear thin. Repeat the process until the entire boot is covered in fresh polish. You may need six or seven coats to get a good shine. Get more tips on how to shine leather tactical boots from 5.11. Taking good care of your boots keeps them looking their best so you can stay in compliance with your force, unit or company's uniform regulations – or just stay looking sharp. Proper cleaning helps ensure that you'll get plenty of mileage out of your favorite boots. 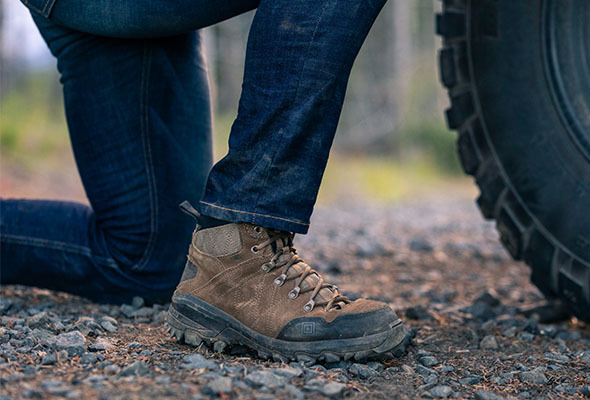 Clean your tactical boots every time they pick up mud, dirt or debris, and if you're not wearing them often, store them inside socks to keep the dust away – just slip a sock over each boot as if it were a foot.